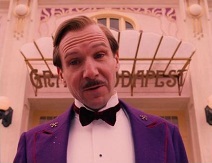 Alexandre Desplat's fruitful collaboration with quirky director Wes Anderson continues with The Grand Budapest Hotel. An acclaimed story of a 1930s European hotel concierge who becomes involved in murder, intrigue and a fight over a priceless painting, the film features an all-star ensemble including Ralph Fiennes, Tilda Swinton, Saoirse Ronan, Edward Norton, Adrien Brody and Willem Dafoe. With Fiennes excelling in a rare comic performance, the offbeat film is also noteworthy for Anderson's typically enticing picture book visuals, often approximating animation more than live action. Anderson's playful narrative, in which flashbacks unfold onto more flashbacks like the equivalent of a Russian doll, gets a suitably whimsical accompaniment from Desplat. The composer has worked on the director's films Fantastic Mr. Fox and Moonrise Kingdom, the former landing an Oscar nomination. Although in his earlier projects Anderson worked with Mark Mothersbaugh, the director now appears to have permanently settled on Desplat, the Frenchman's typically intricate and detailed orchestrations a perfect fit for Anderson's scrupulous visuals and off-kilter humour. Fantastic Mr. Fox mixed up a host of styles, including American-style hoedowns, jaunty percussive interludes and amusing sung performances of author Roald Dahl's "Boggis, Bunce and Bean" limerick. Moonrise Kingdom on the other hand was effectively a seven part suite in which various aspects of the orchestra, from percussion to woodwind to strings, were gradually layered atop one another to compelling effect. The final track (accompanying the film's end credits) then deconstructed the music, detailing the various instruments used. It's clear that Anderson is a director who respects the medium of film music and encourages Desplat to unleash his odder, more creative side. The Grand Budapest Hotel is no different – but what it does have above the other two scores are clearer themes, ensuring greater coherency within the score itself. And whereas both Fantastic Mr. Fox and Moonrise Kingdom felt like enjoyable exercises in texture, Grand Budapest is possessed of an appealingly nostalgic and wistful tone, capturing the film's story to a tee. Fittingly for a film set in a fictional, mittle-European republic, the score is resplendent in the authentic sounds of various European countries. Instruments used include the cimbalom (used so memorably by John Barry in The Ipcress File), zither (familiar from Anton Karras' classic The Third Man) and balalaika (a three-stringed Russian instrument heard in Maurice Jarre's score for Dr. Zhivago). These qualities become immediately apparent in the score's delightful main theme, first heard in "Mr Moustafa". An endearing piece for the aforementioned plucked instruments it's both eccentric and lovely, bottling the essence of Europe in times gone by. The theme occurs several times throughout the score, giving a pleasing sense of continuity and structure. But it's not the only theme weaving its way through – as is normal with Desplat, he introduces a remarkable host of other ideas that play off each other brilliantly. A variation on the balalaika/cimbalom theme is first introduced in "A Prayer for Madame D", a slightly gloomier piece representing the family locked in conflict with Fiennes' central character Gustave over the priceless painting Boy With Apple. Desplat also isn't afraid to push the music into increasingly melodramatic and absurdist territory, as heard in "Last Will and Testament" which adds a wonderfully doomy pipe organ to the Madame D theme. It also introduces the mock-menacing theme for Willem Dafoe's knuckledustered henchman character, later embellished with amusing 'rum te tum te tum' vocal work in "J.G. Jopling, Private Inquiry Agent". 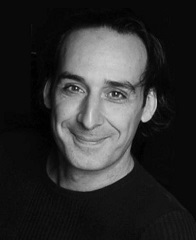 And Desplat isn't done yet. There's yet another principal theme, percussion-led this time, for the "Lutz Police Militia" who end up becoming embroiled in the increasingly surreal and hilarious search for the painting. There's also a standalone percussive piece for prisoner Ludwig (played by a shaven-headed Harvey Keitel) who ends up helping Gustave when he's incarcerated ("Ludwig's theme/A Dash of Salt"). The jittery, bouncy quality of these cues calls to mind Desplat's enjoyably offbeat work on Fantastic Mr. Fox. The varying textures of all these different themes are scattered throughout the gossamer-light score. Highlights include the comical horror of "The Cold Blooded Murder of Deputy Vilmos Kovacs" with its blaring organ arrangement; the multifaceted and compelling percussion of "The Society of the Crossed Keys", which adds the balalaika too for increasingly grandiose impact; and the moving "The War (Zero's Theme)", which presents a tender, undulating variation on the score's main theme. Towards the end of the score, Desplat indulges his more grandiose side to highly enjoyable effect. "Canto at Gabelmeister's Peak" begins with the liturgical choral work before developing into a surprisingly brassy and sturdy action piece. Similarly action-packed is "A Troop's Barracks (Requiem for the Grand Budapest)" with its thundering, relentless percussion rhythms. The score concludes, in "The Mystical Union", with one final, lovely repeat of the main theme, whistled this time, which eventually fades away mirroring the poignant tone of the film's ending. Rounding off everything is a fiendishly complicated, dazzling arrangement for the assembled ethnic instruments (plus male vocals) in the traditional "Moonshine" – a piece of quite staggering complexity and energy. Scores like The Grand Budapest Hotel are indicative of Alexandre Desplat's versatility – to move from the tender Philomena to the rousing, militaristic The Monuments Men to this within the space of six months is a really quite remarkable achievement. Yet even more remarkable is that each score, although very different from the other, is instantly recognisable as a Desplat score. He is a rare breed of contemporary film composer who has managed to carve out a uniquely distinctive voice of his own, whilst also ensuring that said voice is incredibly adaptable to a variety of contexts from dramatic to heroic to whimsical. 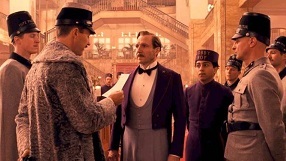 Grand Budapest falls very much on the latter end of the scale and may prove too lightweight to those accustomed to Desplat's more serious works. Yet it's undeniably one of the most accessible of the composer's scores, possessed of a character that's effervescent, odd and surprisingly touching in equal measure. 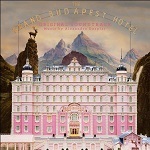 In that sense, there's no denying that Desplat has brilliantly captured the qualities of the film itself, indicating that he is also a brilliant collaborator who is able to give a filmmaker (in this case Wes Anderson) exactly what they want, whilst transcending the essential brief with his highly polished musical skills. And given that directors such as Gareth Edwards are keen to further exploit Desplat's versatility with the likes of Godzilla, there can be no denying that he is one of the great film composers of the modern age.